Inspired by the highly effective RPK brake found on the AK's big brother. 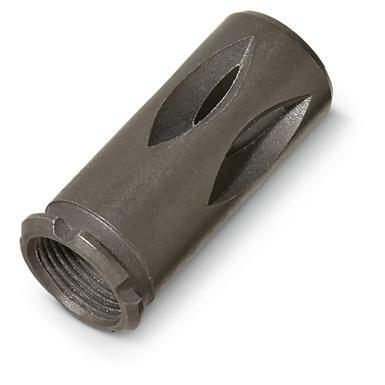 Machined from high-strength steel, and finished in phosphate for years of rugged use and many thousands of rounds. Ready for installation as a replacement for any threaded AK muzzle with 14 x 1 LH threads. TAPCO AK-47 RPK-Style Cage Flash Hider is rated 4.8 out of 5 by 32. Rated 5 out of 5 by TexasHighHeat from Cool looking brake Looks good and fit my RAS47 like a glove. Have not shot yet but I am sure it is better than the stock slant brake. Rated 5 out of 5 by Sandsquid from Works great! Looks great! Rated 5 out of 5 by hoveringhead from great price! can still use my bayonet It fits great on my WASR10. It worked exactly how I wanted. Even better, it still allowed for bayonet use. For what it is, you cant go wrong with it. Rated 4 out of 5 by Saint from AK muzzle break I bought this to replace the standard slant break on my WASR. The break fits fine, but the reason I bought it was because my slant break had a minor wiggle to it, and with the extra detent grooves I was hoping this would fit snug. Unfortunately it still has a wiggle to it, but now I can slap my magnetic bore sight on there at least. I'll have to use a metal file and take a few MMs off to get a perfect fit. Rated 5 out of 5 by JOSEPH from Easy to install, works and looks goot too. Rated 4 out of 5 by JESSE from Looks to be a decent Muzzle Brake for the AKM rifle.And it comes in at a good price. Rated 5 out of 5 by DAVID from This brake looks great. The quality is super and it screwed right on. A good deal. An effective upgrade for your favorite .22.